I thought for today I'd mix it up a bit and post something from Pyung Ahn Edan. We worked on this applicaion in class today. The application is different from most of the applications you see. Most interpretations show a response to two incoming punches. 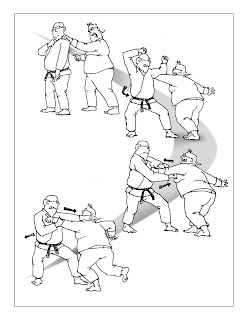 This applications is shown as a response to an attack from a rear shoulder grab. As I mentioned in a previous post imagining the attack will ultimately determine the responses you come up with. Envision various attacks from different angles. Work with a partner. It does not take long to find things that don't work. Over time you will find real gems. In my experience if you do the work to find things that work you are more likely to continue to train the things you find. You can find things in books or on video but there is, for me at least, great pleasure in the hunt. Ippon Seionage in Judo. Of course, if one uses it as such the question remains of the follwoing two movements. The interesting part of Kata is you have the option of interpreting movements as a single or a combination. As you say, if it works, fine. I have never made the connection to Ippon Seionage. That could be a nice option. I do teach movements 7, 8 and 9 as a throw. We use the side kick and hands pulling back as a variation of Harai- goshi. It works really well.